When we bought this farm in 2001, our dream from the start was to turn it into a guest house. The location and size of the property made it ideal for the plans we had for it. We had long since been won over by the area, known as the 'pays bigouden': we loved the changing landscapes, the richness of the area's history and the bustling energy of its ports. The layout of the farm is typical of the area, and we immediately recognized the potential of the site: a barn we could restore and convert into guest rooms, and several other smaller buildings positioned around a large central courtyard that could become the focal point of the gardens and land that encompassed it. The courtyard would serve both as a place where people could meet or be alone if they wished. Penfond has been painstakingly restored according to local building traditions. Some of the best local builders in the area helped us achieve our aim. The materials we used are, for the most part, natural and of high quality. We opted for organic mortar for the stonemasonry; we chose wood and hemp insulation; lime, sand, and hemp plaster, and the substantial use of local wood for the frameworks. The guest-house has been specially designed to encourage guests to meet and talk and exchange experiences. This reflects our belief that the best memories are founded on hospitality and conviviality. A large and cosy communal room is available to all, and can be used at any time. A large room with an open fire is a welcome place after a day on the beach, a long walk in the dunes or through the fields, or perhaps on a rainy afternoon. There are board games and books for all ages available to guests. The house has 1 twin room, 1 triple room and 1 four-bed room. All have their own bathroom and shower. 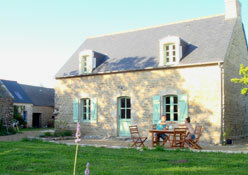 A terrace at the front of the guest house opens on to a large, private garden surrounded by fields. It is the perfect place to sit and relax. There is a small vegetable garden and a lawn where children can play. We are members of the Acceuil Paysan (The Countryside Network), an organisation that unites people in France committed to making the countryside a vibrant and active place. When you visit us we would be happy to share our rich, rural environment with you and help you better understand how it functions. 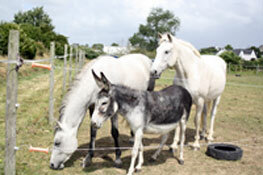 We share Penfond with horses, a donkey, hens, and bee hives. There are many fruit trees, as well as a larger vegetable patch that produces a wide range of produce. Penfond changes subtly with the seasons. In the summer the farm is host to family and friends as well as guests, and there is plenty of space for all to share this delightful place. In the autumn and winter months there are more opportunities to discover in more detail how the farm functions on a day-to-day basis. 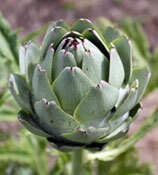 Some will love the animals, others the wide range of fruit and aromatic herbs. Many will love both. Our professional project, to develop local farm production, is also important as it makes it possible for us to offer our guests a wide variety of products such as vegetables, eggs, honey, jams, and other home-made items.